Carlisle Academy is a Premier Accredited Center of PATH, International, a USPC designated Pony Club Riding Center, as well as a International Para-Equestrian Dressage Center of Excellence by the United States Equestrian Federation and the United States Para-Equestrian Association. The Academy works with 100 students per week and serves over 300 participants each year. The Academy is led by the Head of School, Sarah Chappell Armentrout, an Advanced Level PATH, International Instructor & Mentor, certified since 1995, maintaining a strong belief in an inclusive environment, a collaborative team approach, and program excellence. Our Sports Program is staffed by a team of nationally certified instructors and internationally qualified coaches. We offer recreational, adaptive, para-equestrian sports, and pony club programs for youth and adults within an inclusive, community-building environment. The Sports Program has a distinct sport orientation offering both educational and competitive opportunities, complemented by the availability of Carlisle’s on-staff therapists who can provide athlete consultation on functional movement, strength, and equipment needs. Our Therapy Program is staffed by one occupational therapist trained and credentialed in hippotherapy and one physical therapist who has earned the esteemed status of Hippotherapy Clinical Specialist (HPCS) through the American Hippotherapy Certification Board, which represents the highest level of credentialing in the field. 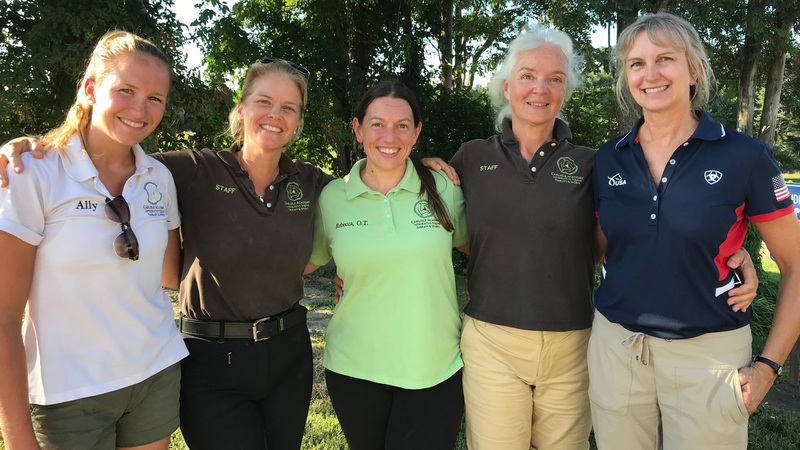 Professional horse handlers are on staff to long line and manage horses, creating safe, consistent lessons and optimal outcomes for the riders. The team is rounded out by lesson apprentices and clinical interns offering side walking support, while gaining professional mentoring in therapy and education. With our composition of highly talented and credentialed staff, the Academy has emerged as a center of excellence and leader within our industry.